I read this article and thought it might be interesting. The article is called The deception that elevates us – How the way you think you learn best isn’t the best way to learn and is located at http://www.josepicardo.com/education/the-deception-that-elevates-us/. The nature of learning is complex. The most effective learning strategies are not intuitive at all and often run counter to what we believe makes for successful learning. In this blog, I will aim to pin down with a bit more clarity what learning is and to explore some of the implications for curriculum design at a time when schools are facing the introduction of new specifications at GCSE and A level. In my own experience as a student, cramming into my head facts, equations and information that I was able to regurgitate pretty much verbatim in tests made me feel like a very successful learner. My evaluation sheet at the end of every term looked pretty impressive. I was happy. My parents and teachers were happy. Everyone was happy. But I had a shameful secret: by the time the evaluation sheet got published, I could hardly remember anything from the tests in which I had apparently done so well. So, if I hadn’t retained my knowledge beyond the test, had I really learnt anything at all? Well, it depends on how you define learning. If learning means being able to recall information when required, say in a test, then yes, I had learnt. However, in Make it Stick, Brown, Roediger and McDaniel define learning as the acquisition of “knowledge and skills and having them readily available from memory so that you can make sense of future problems and opportunities”. But the word future in this definition has always nagged me. How far in the future? The following morning? In the end of year exams? Forever after? Early research in cognitive psychology highlighted the ephemeral nature of memory retention. 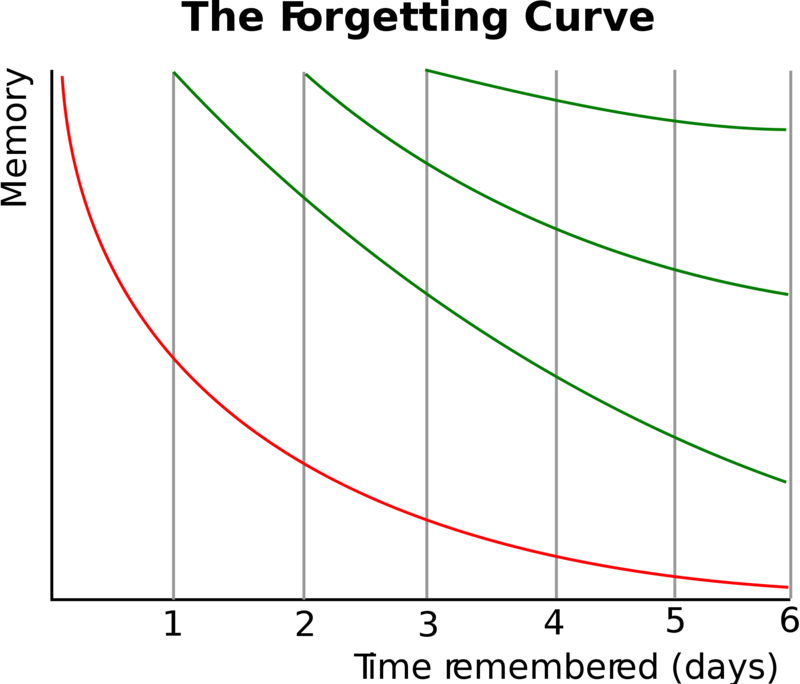 This was most famously illustrated by Ebbinghaus and his Forgetting Curve. Ebbinghaus’s research predicted that if I studied osmosis and I were tested the day after my studies, I would probably do very well in that test. The conclusion would be that I had indeed learnt about osmosis. However, if I were tested on day 6 instead, we would probably reach opposite conclusion: I had learnt close to nothing about osmosis. Since Ebbinghaus showed that memory fades quickly in a matter of days, it would be tempting to question what the point is of learning facts, events, dates or indeed anything at all. But, as Benedict Carey shows in How we learn, although forgetting “seems like the enemy of learning  the truth is nearly the opposite”. So, was I too harsh on my younger self? Or was I and were my teachers unwittingly deceiving ourselves that I was, in fact, learning even though most of the knowledge I acquired for tests faded away after just a few days? Well, yes and yes, on balance. As Daniel Willingham points out in Why don’t students like school? “if you pack lots of studying into a short period, you’ll do okay on an immediate test, but you will forget the material quickly.” The sort of learning that my teachers encouraged me to do all those years ago is very much like the sort of learning that, to this day, I hear teachers promoting among their students, in the belief that spending hours upon hours rereading material will result in long term retention. Many of us will be facing the introduction of new GCSE and A level courses next year. In these new courses, linear approaches are heavily favoured over modular approaches, with a much reduced emphasis on coursework components (which are, in fact, being removed altogether in many subjects). Subjects which found themselves shackled to the module-assessment-module-assessment model will now find that they have much more flexibility in terms of how their subject content can be delivered. It is a great opportunity for curriculum designers to plan not just the teaching of these new curricula, but also the kind of learning that they would like to promote among students. Brown, Roediger and McDaniel sustain that “spaced repetition of key ideas and the interleaving of different but related topics” are the essential components of successful learning and long term retention. These are the low truths that compete against the deception that is learning by cramming. In practice, this means eschewing the modular approach to learning about a subject and enshrining the revisiting of topics and concepts in our our schemes of work and programmes of study, as well as the linking of topics which would have previously stood alone as single units. Revisiting topics and concepts would naturally encourage the sort of strategies that support effective long-term learning, making the most of the way our brains allow information to fade away to form the foundations of new learning. As Carey reminds us, forgetting stuff is fine, “some breakdown must occur for us to strengthen learning when we revisit material”. It is this revisiting that helps us secure knowledge for the long term, building taller on the residue left by previous visits to the topic. These strategies might include frequent low-stakes testing (they could take the form of self-testing, games or quizzes – not all testing is evil or boring). According to Brown, Roediger and McDaniel “retrieval practice – recalling facts or concept or events from memory – is more effective learning strategy than review by rereading. Flashcards are a simple example”. Retrieval strength – i.e. how easily a fact, concept or a piece of information comes to mind – without reinforcement drops off quickly. This can result in excellent exam results but poor long-term retention. Ebbinghaus showed this all that time ago. What curriculum designers need to do is take greater care in planning the learning of their subjects, not just the teaching. They need to consider, not only what the teachers will do and what resources they will use, but also what the students will be doing and thinking, so that great learning is encouraged, not just given lip service to. Otherwise we will continue to deceive ourselves into thinking we are learning when we are really not. — Is technology changing our brains?